RGV FC Toros' Todd Wharton (14) and Colorado Springs Switchbacks FC's Jordan Schweitzer (22) battle for the ball during a United Soccer League game at H-E-B Park on Saturday, July 28, 2018 in Edinburg. 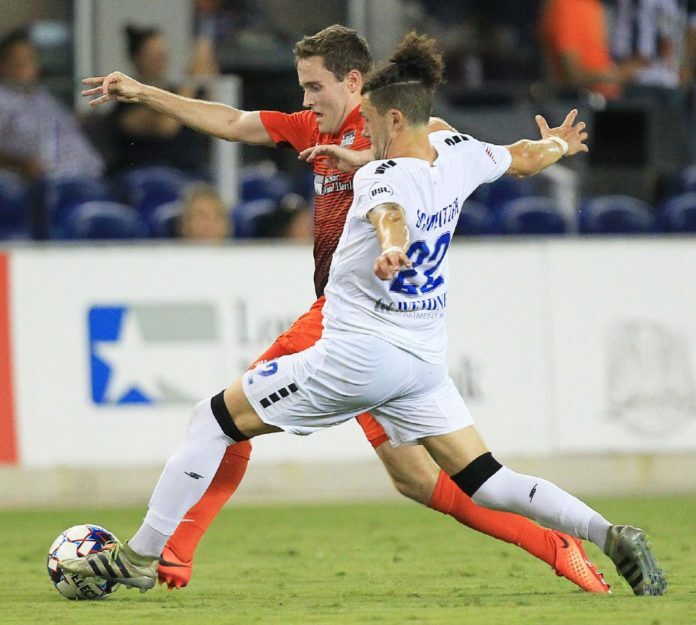 EDINBURG — In the middle of March, just days before the RGV FC Toros opened the 2018 campaign, captain Todd Wharton said his goal for the season was to be more active and aggressive playing the ball forward. A defensive, holding midfielder by trait, Wharton wanted to take more chances on the attack rather than simply managing play by moving the ball side to side. Fast forward to the home stretch of the season, and the stats show Wharton has hit many of his aims. Among several improvements from his numbers last season, the third-year Toros midfielder leads the team with 60 chances created — 38 better than his total last year and by 27 the highest tally on this year’s team. Wharton was more humble in his self-evaluation. He said his high total of chances created needs to be viewed in the context of him taking many of the Toros set-piece opportunities. He also pointed to RGV’s general struggles on offense. The Toros rank tied for 31st out of 33 USL teams with only 28 goals scored this season — perhaps the biggest reason RGV is 5-11-13 and has been officially eliminated from playoff contention. As the team’s captain and leader by example, Wharton naturally elected to shoulder the blame for the Toros’ shortcomings. He said he could have taken more chances playing dangerous balls forward, but he also admitted that the team’s midseason shift to play just one defensive midfielder rather than two added to his difficulty contributing to the attack. Echeverry was also hesitant to connect the team’s lack of scoring to Wharton’s contribution in the midfield. Wharton leads the Toros in minutes in 2018, and his strengths in possession and on defense are rarely questioned. He is the team’s leader in passes this year after ranking fifth on the 2017 squad, and he makes 46.9 passes per 90 minutes this season compared to 40.6 last season. He has 27 shots this year versus 20 last year, 15 shots on target this season against nine in 2017, and four goals this year against just one last season. He also leads the team with 65 tackles. Wharton said his contract with RGV expires at the end of the year, adding that he hasn’t spent any time planning his next move. Echeverry said Wharton possesses many traits that MLS teams find attractive. “It’s been a pleasure so far. He’s done very well, and we’ll see what Houston sees of his performance this year,” Echeverry said. While RGV has already fallen short of its team goals, Echeverry said every player on the roster wants to be sharp down the stretch in an effort to earn a contract for the 2019 season. The next opportunity for RGV is a matchup against Seattle Sounders 2 at 7:30 tonight at H-E-B Park. Wharton said he believes his next destination may be the MLS.